"Our wedding trip to Aventura Spa Palace was wonderful! Beth had everything taken care of for us from a welcome cocktail reception for all of the guests to our reception immediately following the ceremony. The resort was beautiful and we'll be going back soon!" Call a Palace Resorts Wedding Specialist Today! We have many resorts that offer FREE DESTINATION WEDDING PACKAGES. Some of these resort are higher end and may cost your guest more than a resort that does not offer free weddings. If you are planning a wedding and inviting guests, pricing for their travel arrangements should be a top consideration when choosing a wedding resort. Be careful, some resorts that offer "free weddings" come with restrictions like a minimum number of nights or certain room categories. Please consider all our options when making your decision on where to host your Destination Wedding. Our wedding experts have years of experience booking wedding groups and individual travel arrangements to Mexico. If you are inviting guests to your destination wedding, we'll make it affordable so as many guests as possible can attend. Our agents visit the destinations & resorts often, inspect the hotels & ceremony locations and will provide you with the best customer service and value. Applies to USA and Mexico residents. Free wedding package must be reserved in advance at least 7 business days prior to arrival at the resort. Free wedding package will not apply if requested on site. This offer is valid only for guests staying at any of our Wedding Resorts (Cancun Palace, Moon Palace Golf & Spa Resort or Aventura Spa Palace) for the entire stay. Wedding guests residing at a non Palace Resorts property are required to purchase a day pass. Applies to USA and Mexico residents. 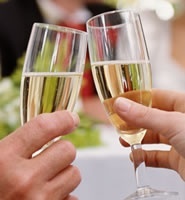 Free wedding package must be reserved in advance at least 7 business days prior to arrival at the resort. Free wedding package will not apply if requested on site. This offer is valid only for guests staying at any of our Wedding Resorts (Moon Palace Golf & Spa Resort or Aventura Spa Palace) for the entire stay. Wedding guests residing at a non Palace Resorts property are required to purchase a day pass. This free package is only available with your reservation of our honeymoon suite for a minimum stay of 7 nights. Reservation of a Junior Suite Ocean View category or higher for a minimum of 7 nights stay is required for this package. Restrictions/exclusions: Subject to Availability. Occupancy for Double Only. The Free Sweet Wedding Package is valid when booking a Casita Suite for a minimum of 7 nights or more plus 5 rooms (any category for 3 nights or more). Valid in Canada, USA and reservations booked at published rates. Must be reserved 30 days in advance. more plus 5 rooms (any category 3 nights or more). Must be reserved 30 days in advance. Reservation of a Junior Suite Ocean View Excellence Club category or higher for a minimum of 7 nights stay is required for this package. This package may be purchased for $ 699 USD. Note: Cannot be combined with the Secrets Eternity Honeymoon complimentary package. You must reserve a minimum of 10 Royal Club Jr. Suites for at least 4 nights to get this free wedding package. Valentin Imperial Maya is a luxury adult only Resort. Book your stay for stay a minimum of 7 nights or book 5 rooms or more for a minimum of 4 nights and receive a Complimentary Wedding package that includes a full array of premium services. Applies to USA and Mexico residents. Free wedding package must be reserved in advance at least 7 business days prior to arrival at the resort. Free wedding package will not apply if requested on site. This offer is valid only for guests staying at any of our Wedding Resorts (Playacar Palace, Moon Palace Golf & Spa Resort or Aventura Spa Palace) for the entire stay. Wedding guests residing at a non Palace Resorts property are required to purchase a day pass. Reservation of a JUNIOR SUITE OCEAN FRONT category or higher for a minimum of 7 nights stay is required to receive this package. Note: This package cannot be combined with the Secrets Eternity Honeymoon package. This package may be purchased for $ 699 USD. To obtain this Complimentary Wedding Package a reservation on a Premium Ocean view category or higher for a 7 nights stay is required. Reservation of a Junior Suite Ocean View category or higher for a minimum of 7 nights stay is required for this package. Note: Subject to availability, double occupancy only. To be eligible for the Melia Free Wedding Package the couple, & their guests, must book a minimum of 25 room nights at double adult occupancy in second (or higher) category rooms/suites. Sol Melia will cover up to $ 300 USD in legal fees; remaining fees are to be paid locally with our In-House Wedding Specialist in our Melia resort. This offer is only valid for guests staying at Vallarta Palace for the entire stay. Note: Package inclusions cannot be exchanged for additional services. Some restrictions apply. Free wedding package applies to USA & Mexico residents only. Weddings are only performed at Vallarta Palace. Wedding guests residing at a non Palace Resorts property are required to purchase a day pass.